eyeSpace existed in three different versions: one of twenty minutes’ duration, and two of forty minutes. The dance in the 20-minute version comprised three sections: a quartet, a series of three trios of which the first two overlapped, and a duet. 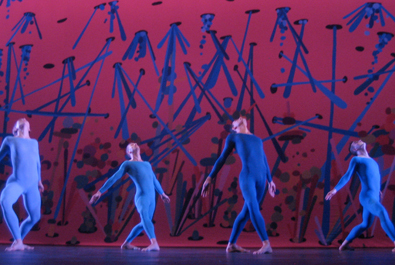 Mikel Rouse’s score incorporated the use of iPod Shuffle mp3 players and an environmental soundscape performed live by one or two musicians, projected throughout the theater. Members of the audience could listen to the music on iPods (available on loan) or, if they preferred, to the ambient sound component (without headphones). Henry Samelson’s décor backdrop suggested an imaginary landscape painted in bright colors. 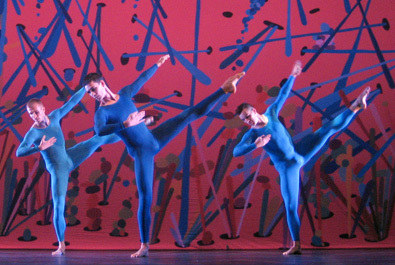 The costumes were unitards in various shades of blue.